At more than 400 kilometers an hour, terrestrial images are fugitive; he had no sooner perceived the first lines of moving waves than he was flying over the immense sheet of water, beginning the Atlantic crossing. At that moment, he had experienced a shock in his heart. He clutched the controls of his machine in tremulous hands and said to himself: "I shall reach America!" 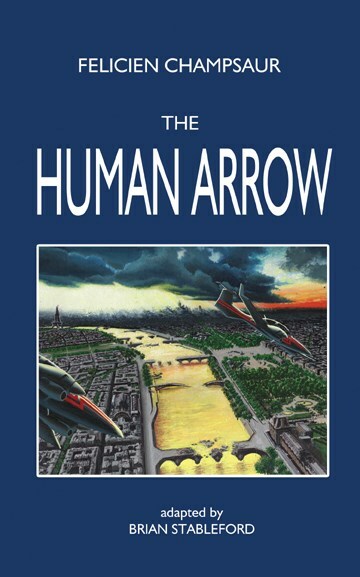 The Human Arrow, written just prior to World War I, is the story of the first non-stop Paris-to-New York flight by rocket-powered plane as it never happened. French engineer Henri Rozal faces tough competition from rivals for the hand of his fiancée, as well as shady dealings from financiers trying to steal his invention. But as the shadow of war looms, is Rozal's utopian dream of a peaceful planet traversed by powerful flying machines fated to turn into an apocalyptic nightmare? This edition is the first time that the two versions of the story, the original 1917 edition as well as its rewritten conclusion published in 1927, to take into account Charles Lindbergh's flight and the horrors of World War I, have been published in a single volume. Also included is Champsaur's novella, The Last Man (1885), which describes how a comet increases the oxygen in Earth's atmosphere and causes Paris to revert to a jungle, and Man to an ape-like beast.